Mountain House Cans Sale: up to 40%-off! Members get BIG rebate certificates! Beat the July 1 price increases! Our one-week Mountain House Freeze-Dried Maximum Discount Sale runs June 1-7, 2013. Note that the value and impact of this huge preparedness opportunity is magnified due to the fact that some Mountain House can prices are going up significantly on July 1. 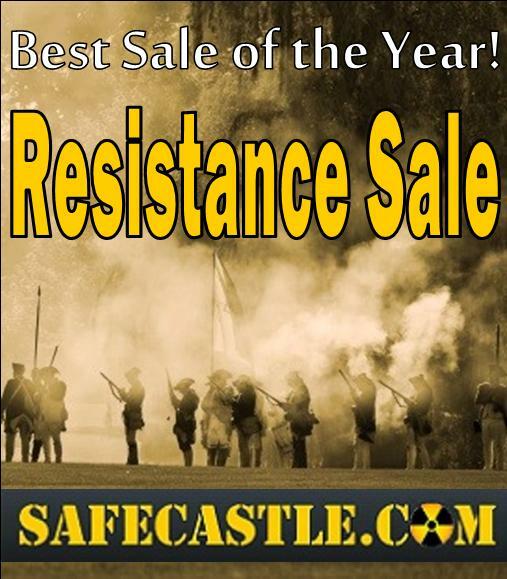 Safecastle is renowned for the awesome MH Sales we put on ... and the fact that club members and non-members alike get the same maximum-allowed discounted prices. Buyers club members do also get BIG Royalty Rewards rebate gift certificates for qualifying purchases! 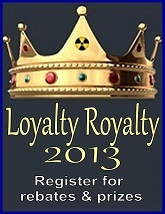 ... not to mention the added value of participating in our 2013 Loyalty Royalty program. SHOP NOW and get maximum allowed discounts of 25% to 35% and even to 40%-off Mountain House can-case listings! Free shipping to the lower 48. All MH orders ship fresh to you, straight from the MH factory within days. 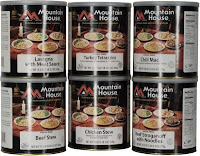 Quick word on Mountain House canned food: As most know, it is the premier emergency storage food in the world. In cans, it stores for 25-30 years! Almost all varieties are precooked and ready to to eat after rehydration. The way food prices are continually rising, many see unique, top-quality storage food like MH as an investment. Certainly, there is not a better edible insurance policy for your family anywhere. Last Day of the Resistance Sale! Loyalty Royalty Drawing June 1! In addition to that, for any transaction totaling at least $750, a Safecastle gift certificate worth $25 will be emailed to you (within one business day). Or a $1200 transaction will get you a $50 gift certificate. Or a $1600 transaction will get you a $100 gift certificate! Or a $2000 transaction will get you a $150 gift certificate!! Note that these gift certificates will expire June 3, 2013, so they must be used promptly. Remember--this month we are guaranteeing low prices for our members on all Mountain House foods--cans and pouches--as well as on 25 other key prepper treasures. 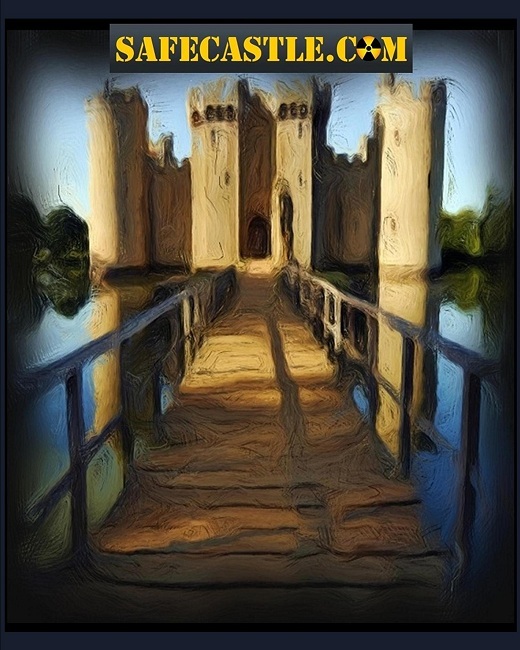 ON TOP OF ALL THAT (the price discounts and the incentive freebies) ... our 2013 Loyalty Royalty program guarantees registered participants a year-end rebate of between 1 and 11% on all their Safecastle purchases between Apr. 1 and Dec. 31! Plus great odds on winning a monthly prize! Our next Loyalty Royalty program monthly drawing is Saturday morning, June 1. Some lucky registered Loyalty participant is going to win a Future Essentials Meat Combo case, worth almost $200! And of course, your buyers club member discounts and our free shipping policy still stand as the underlying foundation beneath all of the crazy additional opportunities above that are available to you only during this month of May. Mountain House Can Prices Jumping as much as 35% July 1! Get Sale Discounts of up to 40% Now While You Can! On July 1 Mountain House can pricing, set by the manufacturer, is going up by as much as 35% (see specifics below). The good news is that as a Safecastle buyers club member, right now you can purchase any MH variety in cans at maximum-allowed discounts of up to 40%-off pre-price-hike prices!! Moreover, when you do so during our current PRESALE event during May only thru May 23*, you get an outstanding array of additional freebies for qualifying orders. June 1 starts our official Mountain House Freeze-Dried Maximum Discount Sale when members and non-members can get the same full discounted prices, but club members who order in May get "Prepperential Treatment": See details here. Get maximum allowed discounts of 25% to 35% and even to 40%-off Mountain House can-case listings! Needless to say, there is going to be a surge in demand between now and July 1, so if you intend to do any stocking up on the very best long-term storage food in the world, you better act fast or you will end up at the end of the rapidly lengthening queue. * May 21, 2:30pm NOTICE-- Oregon Freeze Dry has put a stop to our MH cans Presale due to "unfair competitive advantage." We have only thru Thursday, May 23, to allow club members to place MH cans preorders (& to thus also qualify for our Resistance Sale goodies available in May). It's increasingly obvious even to the administration's previous lapdogs (Bill Maher, Piers Morgan) that they and indeed WE the voters have empowered a boldly tyrannical executive branch to run roughshod over traditional American values, our Constitutional liberties, the judicial system, and to American citizens of all demographics who stand in the way of their frightening vision for our country. Deception and manipulation were the recognized political methods in play in this administration's first term in office. This second term has quickly shifted public awareness to the forceful, lawless power projection being used against opponents via any and all tools available at the administration's disposal. Few individuals inside or outside the system have had the courage to stand up to defy this clear and present threat to America. Those who have have been abused and pilloried. Yet, the series of outrageous scandals erupting in the media in the last two weeks have put these thugs on notice that there is still some fight left in us and that maybe, just maybe, we aren't going to take it anymore. I pray that is the truth of the matter. If you intend to be a part of the solution going forward, then you need to ready your stance right now. 1. Prepare ... in any and every fashion your circumstances allow. I shouldn't need to tell you what that means, but I'd suggest a complete look at everything from laying up personal resources and supplies to bolstering your self-defense capabilities and firming up your spiritual foundation. 2. Gather your resolve ... This fight may get ugly. Pain and suffering may be paying many of us a visit. Ask yourself right now if our objective--saving the America we grew up to know and love--is worth that price. When you come to the correct conclusion, get busy fortifying your inner determination. In other words, get your game face on. 3. Be heard ... Fear and concern over losing a personal, comfy way of life keeps many silent in the face of oppression and tyranny. Stand and be heard now while your voice still counts for something. There is power in numbers. Your silence implies consent to the powers that be. Many times throughout history such acquiescence by populations have eventually resulted in genocide. Don't think that it cannot happen here. Don't let that even become a possibility. Prepare and fortify for a fight that is still political but that could conceivably morph into a crisis not seen in this land by anyone still breathing. Get PREPPERential Treatment in our Members'-only 25%-40%-off Mountain House Food Presale Event and Freebie Giveaway! Order in May--Make your Investment Pay! Club Members Ordering Early Get "Prepperential Treatment"
Make your MH Presale purchase this month and you will not only get your order in at the head of the line (June 1 is when we submit your presale orders for fulfillment), but your purchase also qualifies for our amped-up Resistance Sale freebies that are effective only through this fine month of May. Yes--I said amped-up freebies offer. Effective May 14 through May 31, we have made it even easier for you to collect our Resistance Sale freebies--more of them at lower incentive thresholds! 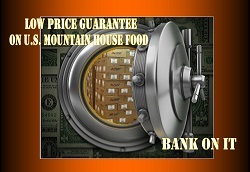 Remember--this month we are guaranteeing low prices for our members on all Mountain House foods--cans and pouches--as well as on 26 other key prepper treasures. ON TOP OF ALL THAT, the price discounts and the incentive freebies ... our 2013 Loyalty Royalty program guarantees registered participants a year-end rebate of between 1 and 11% on all their Safecastle purchases between Apr. 1 and Dec. 31! Plus great odds on winning a monthly prize! Members-Only Mountain House Food PRESALE Event ... Amped-Up Resistance Sale Freebies! Make your MH Presale purchase this month and you will not only get your order in at the head of the line (June 1 is when we submit it for fulfillment), but your purchase also qualifies for our amped-up Resistance Sale freebies that are effective only through this month. Yes--I said amped-up freebies offer. 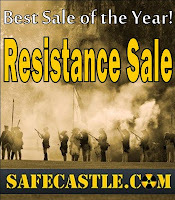 Today through May 31, we have made it even easier for you to collect our Resistance Sale freebies--more of them at lower incentive thresholds! Check the freebies menu here(see #3 on that page). 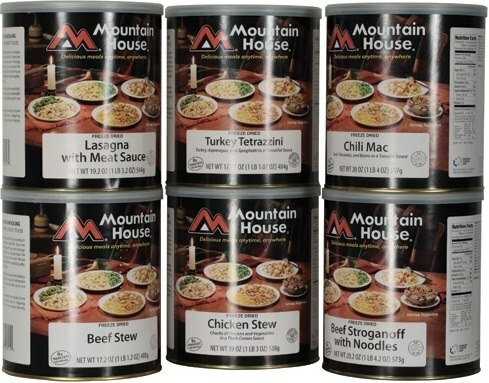 Reminder--this month we are guaranteeing low prices for our members on all Mountain House foods--cans and pouches--as well as on 26 other key prepper treasures. Quite simply, we can do no more than what we are doing this month. We're giving away the store in hopes that it will make a difference for you and our nation in the dangerous times ahead. 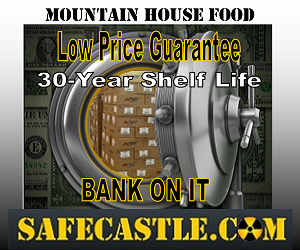 Of course, Safecastle is a long-time key dealer for Mountain House canned food and pouch foods. We've seen several online discussions and articles recently about how food will be the single most important commodity to be holding when the economy collapses. 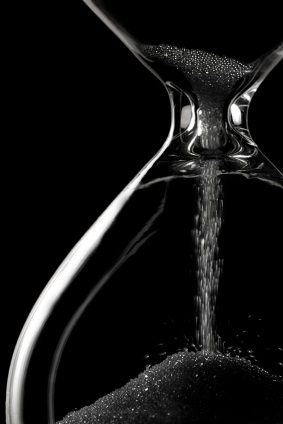 Even precious metals will be further down the list of useful and practical resources that will carry the most value in sustaining you and your household through the crunch. Our mission for many years now has been to provide smart people with the opportunity to maximize their preparedness efforts and to become fully prepared for what is now imminent. Be ready, my friends. The house of cards is far too tall to stand much longer. That may be by design. Those who recognized the true danger early are going to be the ones able to battle through the chaos. This month we are offering an array of interlocking discounts, incentives, and rebate opportunities that are unprecedented in their scope. Discerning members can be assured they are doing their very best to finish their defenses this month. 1. The May Resistance Sale with over 100 guaranteed low-prices for our club members on key foods and gear (including all Mountain House food). 2. The sale also offers free LifeStraws and gift certificates for your qualifying orders. 3. In addition, our Sale category includes long-term storage discounts on many more food packages, prepper gear, folding bikes, etc. 4. ON TOP OF ALL THAT ... our 2013 Loyalty Royalty program guarantees registered participants a year-end rebate of between 1 and 11% on all their Safecastle purchases between Apr. 1 and Dec. 31! Plus great odds on winning a monthly prize! 5. And of course, your buyers club member discounts and our free shipping policy still stand as the underlying foundation beneath all of the additional opportunities above. Quite simply, we can do no more than what we are doing this month. We're giving away the store in hopes that it will make a difference for you and our nation in the days and years ahead. May is Bike Month. 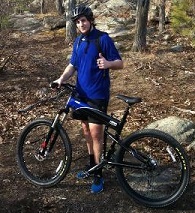 At Safecastle, May is Prepper Bike Month. For the rest of the month, we are selling our primo folding Montague and SwissBike mountain bikes and road bikes, to include the famous Paratrooper, the Paratrooper Pro, and the new top-of-the-line X90. This month, not only are you getting steep sale prices, member discounts, and free shipping on all our folding bikes (and folding bike trailers too), but with our May Resistance Sale member-incentive-offer of free LifeStraws and Gift Certificates applies as well, you score an unbeatable haul!! And that's not all. Finally, our 2013 Loyalty Royalty offer ensures that at the end of the year, you will recoup still more in the form of a rebate gift certificate worth between 1% -11% on top of all that you already are saving! These folding bikes are legendary ... the design was initially the result of a DARPA project for military paratroopers who could jump with these folding bikes on their backs and then hop aboard and make great time on the battlefield. Not only robust and fun--they are practical and easy to stow and carry. Preppers love these bikes ... and I know my family does. Loyalty Royalty April Standings Posted! Are You in the Top 20? We just posted our first Loyalty Royalty Top 20 list. These standings (using customer numbers only) take into account all purchases from April 1-30 of this year. Our next posted update will be in about two weeks. One--registered Loyalty Royalty participants who are in the Top 20 as of the end of the month in May, July, September, and November are the folks who will be eligible for the prize drawing for each of those periods. Example: the Top 20 participants as of May 31 will be the members thrown in the hat for our June 1 prize drawing. The winner of that June 1 drawing will receive a free Future Essentials Freeze Dried Meat Combo Case. Pretty good odds--1 in 20. Two--for better odds, since everyone is a winner ... at the end of the year, those standings will determine the amount of the rebate gift certificate that Loyalty Royalty participants will receive. ALL program participants will receive a rebate gift certificate with a value of at least 1% of their total purchases calculated from April 1-December 31, 2013. The Top 10 participants as posted at the end of the year will receive anywhere from 2%-11% rebate certificates! Believe me, that is going to be some significant moolah! Check the standings now at the bottom of this page, and if you are not yet registered, do so today--it's free for our buyers club members only. Check the several new Future Essentials freeze-dried specialty-food varieties ... 20%-off for club members and free shipping. Through May, in our Member Low-Price Guarantee category, 26 very key products are displayed for which we are guaranteeing lowest price for our buyers club members (vs. any competing online retail store for new product when shipping and handling charges are considered). Any necessary price matching must be done before your purchase is completed. If you find a lower price out there, send the link to Vic Rantala and I will personally beat that price, as well as count your purchases toward our active buyers club incentives that you may qualify for (see "Freebies" below).. We also are guaranteeing low member pricing on all U.S. Mountain House foods. Our member prices on MH pouches and buckets (now rated at 10 years and 25 years shelf life) are the lowest prices out there, including shipping.. On MH cans, dealer pricing is strictly regulated. We are authorized by the manufacturer to at any time match any dealer's sale pricing. And we are always happy to do that while providing you all qualifying member incentives as well (check "Freebies" below). Just email Vic with a link to a current MH cans sale offer that might be out there. v You will be sent one FREE LifeStraw for ANY purchase totaling at least $300. Or two FREE LifeStraws for any purchase totaling at least $500! v In addition to that, for any transaction totaling at least $1000, a Safecastle gift certificate worth $25 will be emailed to you (within one business day). Or a $1500 transaction will get you a $50 gift certificate. Or a $2000 transaction will get you a $100 gift certificate! Note that these gift certificates will expire June 3, 2013, so they must be used promptly.